As Fall approaches, there has never been a better time to start a new and rewarding career. 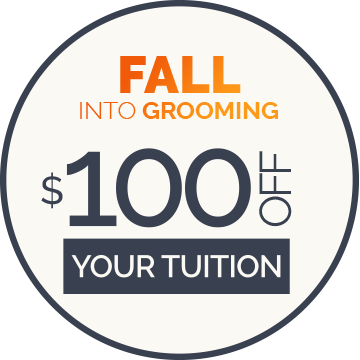 For a limited time only, use the code FALL2018 and take $100 off your dog grooming tuition. The dog grooming industry is full of exciting career possibilities. Whether you enjoy working from home, want to open your own business, or would like to work in an existing salon, you’re sure to find a career path that works for you. With QC’s online course, getting certified is more affordable and convenient than ever. Starting from the very basics, the online dog grooming course teaches you the practical and theoretical skills you’ll need to start your career as a professional dog groomer. You’ll learn from highly-skilled Certified Master Groomers who will provide you with detailed feedback on your work, every step of the way.